The roulette wheel, the carnival game wheel, the Wheel of Fortune TV game show… America loves to spin the wheel, and how much more fun it is to do so when every spin contains a win. Employees of R.B. 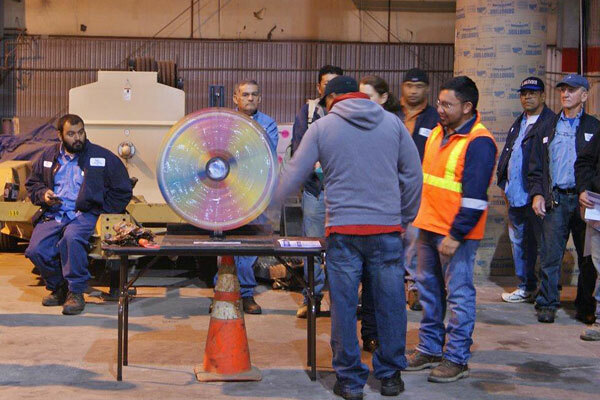 Hinkle Construction, a PLH Group Company, have a chance to spin a prize wheel at 6 a.m. every last Wednesday of the month as part of the company’s new Safety Excellence Program, launched in the fourth quarter of 2015. Team members are nominated for recognition of their acts of safety by company foremen, safety department members, executive management or even clients, said Ed DeNeale, R.B. Hinkle Safety Director. Each nominated employee — and there were 25 nominations during the program’s first month — receives a Safety Excellence certificate and a food gift certificate at the monthly recognition event. Then all nominees’ names are entered in a random drawing for two big monthly prizes. If the first name drawn is that of an employee who works in R.B. Hinkle’s Sterling headquarters office, that person automatically receives what DeNeale says is the most coveted prize of all, month-long use of a prime parking spot closest to the door. The person whose name is drawn second (or first, if it’s an employee from R.B. Hinkle’s Maryland offices in Beltsville and Boyd, which don’t have the same parking issues) gets to spin the safety prize wheel. The wheel is populated with desirable gifts and perks, such as a new pair of work boots, a $200 Visa® gift card, a $200 gasoline gift card, a movie and snacks pack from the local cinema, an extra vacation day or lunch with the R.B. Hinkle President.